5th to 17th May 2018. 1st to 4th June 2018. The new themes explored during these four days require deeper introspection and bring a deeper contact with oneself and with the world around. 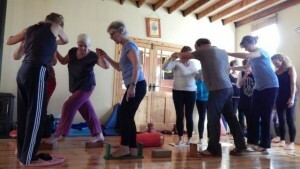 This workshop helps to integrate ATB further into oneself. 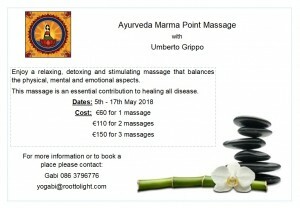 Venue: Root to Light Yoga Space, Tullamore. Cost of weekend €240 and a deposit of €80 secures your place. For more information or to book a place please contact Gabi 086 3796776 yogabi@roottolight.com. Astanga Yoga With Dr. Vinayachandra BK, Dr. Anuradha Choudry & Gabi Gillessen. Cost: €240 for 4 days, €200 for 3 days, €160 for 2 days, €120 for 1 day.